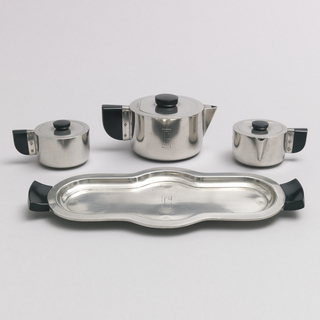 See more objects with the tag tableware, silver, geometric, metalwork, serving , serving ware. This is a Sugar bowl. It is dated ca. 1928 and we acquired it in 2013. 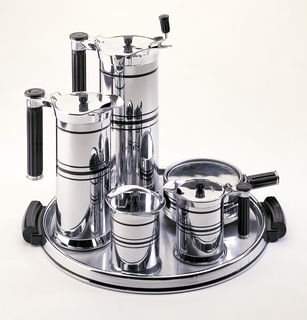 Its medium is electro-plated nickel silver. It is a part of the Product Design and Decorative Arts department. After studying in Budapest, Karasz arrived in the United States in 1913, where a little over ten years later she began to establish herself as an influential designer in a variety of media. Although her designs show multiple references to her European past, they also display a combination of modern ideas associated with her new home. 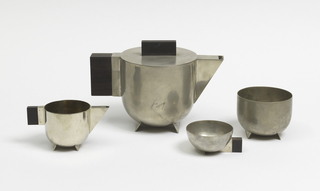 In this silver-plated sugar bowl and creamer, she developed the idea of using one form and adapting it with additional elements and parts. 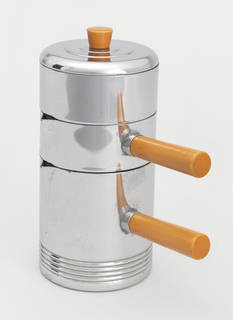 The use of silver-plated nickel—instead of expensive solid silver—and the pure geometric shapes that imply industrial production, made these serving pieces easy to clean and maintain. 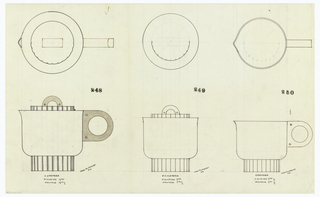 This object was featured in our Object of the Day series in a post titled Modern Geometry. 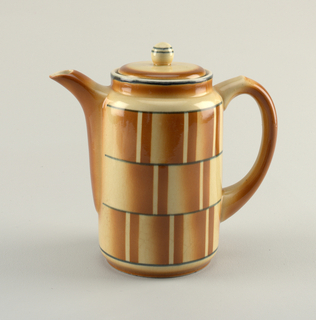 This object was previously on display as a part of the exhibitions	Ilonka Karasz, Works from the Collection and Energizing the Everyday: Gifts From the George R. Kravis II Collection.